The US Secretary of State Colin Powell says Washington will elevate its military ties with Pakistan, making it a major ally outside of Nato. He was talking in Islamabad ahead of talks with President Pervez Musharraf. His visit coincides with renewed military action by Pakistan's army against al-Qaeda and Taleban suspects and their supporters. Troops and helicopter gun ships backed by fighter jets have been taking part in the operation. Mr Powell said the elevation of relations with the US was a reward for Pakistan's unstinting efforts to hunt and find al-Qaeda suspects sheltering in Pakistan. He paid tribute to its contribution to the fight against global terrorism, which correspondents say is unpopular with many people in Pakistan sympathetic to the Taleban and still hostile to the US. 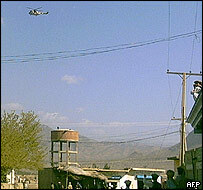 The BBC's Zaffar Abbas in Islamabad says the military action in the South Waziristan tribal region is the biggest operation against al-Qaeda and Taleban remnants for more than a year. Officials say helicopter gun ships were assisting the ground forces on Thursday in clashes near the town of Wana, in which heavy arms were being used by both sides. Fighter jets have also been seen in the area. Residents near the battle said they could hear artillery being fired by the government side and see columns of smoke snaking into the sky. The security forces gave a three hour notice to local residents early on Thursday morning to vacate their houses before hundreds of paramilitary and army troops moved into the area to take on armed militants believed to be hiding in the mountainous area. In a separate development in north Waziristan, the amry says two of its soldiers were killed in a rocket attack in the remote Shawal area. 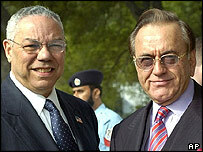 Mr Powell met President Pervez Musharraf for talks as the fighting took place. Our correspondent says that the visit put the president in a difficult position, because he is widely perceived by opposition parties in the country as an American proxy who would never say no to a demand from the United States. Before meeting General Musharraf, Mr Powell repeated Washington's concerns over the nuclear proliferation network set up by the top Pakistani scientist, AQ Khan. "Questions have arisen as to not only what Dr Khan and his associates might have been doing but was there any other knowledge within the government at the time it was happening," Mr Powell said. The Pakistan authorities have insisted Dr Khan was working on his own. "I think this is a logical and proper question to ask and I am sure that Pakistani authorities would want it known as well," Mr Powell said. The talks with the Pakistani government also focused on Kashmir and the current peace efforts between India and Pakistan. Mr Powell's recommendation to the US Congress that it would designate Pakistan a "major non-Nato ally" would enable closer military co-operation between the two countries. In effect, Pakistan now joins a club of 10 or so militarily most-favoured nations that include Israel, Egypt and Jordan among them. It may make it easier for Islamabad to acquire the arms it needs to compete with India in conventional weapons. Officials say that 24 suspects were killed in Tuesday's fighting, but they were only able to recover bodies of two foreign men believed to be Chechens. The authorities believe that foreign militants are still hiding in the semi autonomous tribal region that borders Afghanistan, and have launched the operation after local tribesmen refused to hand them over. Over the past two years Pakistan has arrested around 570 al-Qaeda suspects, many of them in risky operations. Pakistan is the third country of Mr Powell's South Asian tour, following India and Afghanistan. "Many people in Pakistan remain suspicious of the US's long term intentions"